Kusadasi Turkey Travel Guide gives you handy information on the city and the area and interesting things you can do in and around. Kusadası is a resort town on Turkey's Aegean coast. Kusadası is 95 km south of İzmir. The municipality's primary industry is tourism. It was known as Ephesus Neopolis, during the Byzantine era, and later as Scala Nova or Scala Nuova under the Genovese and Venetians.Kusadasi was adopted in its place at the beginning of the 20th century. Saint John the Evangelist and (according to Roman Catholic sacred tradition) the Virgin Mary both came to live in the area, which in the Christian era became known as "Ania". Kusadası caters to tourists arriving by land, or from the port for cruise ship passengers heading to Ephesus. In a controversial deal in 2003, the previously public-owned port was leased to a private company and renovated to attract luxury cruise liners. The area features several well-known local beaches, including Ladies Beach, the beach at the centre, the beaches between the Batıhan Hotel and the Nazilli Site, the beach at Güzelçamlı, and the Dilek Peninsula National Park beach, referred to by locals as simply Milli Park. Also, most of the luxury hotels have gyms and exercise rooms. The area has been a centre of art and culture since some of the earliest recorded histories and has been settled by many civilisations since being founded by the Leleges people in 3000 BC. Later settlers include the Aeolians in the 11th century BC and Ionians in the 9th. Originally, seamen and traders built a number of settlements along the coastline, including Neopolis. 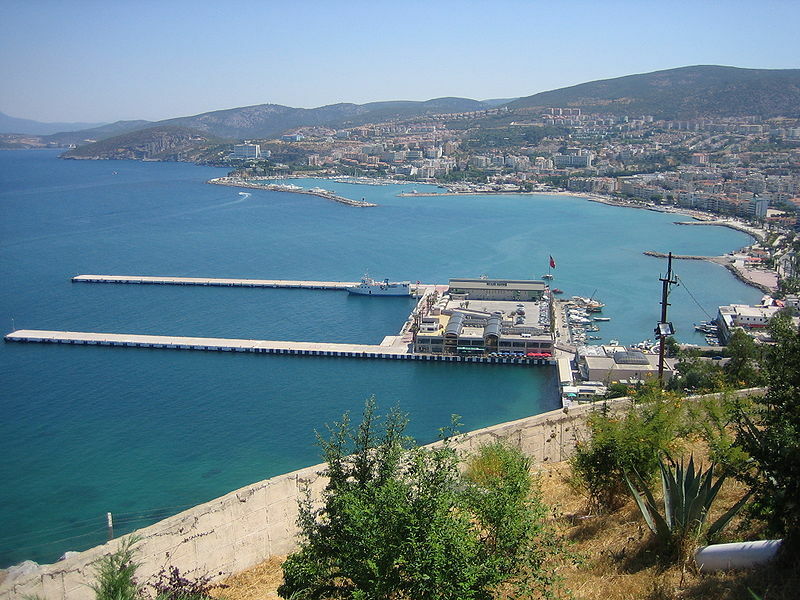 Kusadası was a minor port frequented by vessels trading along the Aegean coast. In antiquity, it was overshadowed by Ephesus, until Ephesus' harbour silted up. From the 7th century BC onward the coast was ruled by Lydians from their capital at Sardis, then from 546 BC the Persians, and from 334 BC, along with all of Anatolia, the coast was conquered by Alexander the Great. From that point on the coastal cities in Anatolia became a centre of Hellenistic culture. Kusadası is a start point to visit the famous places nearby like: Ephesus was an ancient Greek city on the coast of Ionia, three kilometres south-west of present-day Selcuk in İzmir Province. It was built in the 10th century BC on the site of the former Arzawan capital by Attic and Ionian Greek colonists. During the Classical Greek era, it was one of the twelve cities of the Ionian League. The city flourished after it came under the control of the Roman Republic in 129 BC. The city was famed for the nearby Temple of Artemis (completed around 550 BC), one of the Seven Wonders of the Ancient World. Among many other monumental buildings is the Library of Celsus, and a theatre capable of holding 25,000 spectators. The city was destroyed by the Goths in 263, and although rebuilt, the city's importance as a commercial centre declined as the harbour was slowly silted up by the River. It was partially destroyed by an earthquake in 614 AD. The ruins of Ephesus are a favourite international and local tourist attraction, partly owing to their easy access from the cruise ship port of Kusadası, some 30 km to the South. The House of the Virgin Mary is a Catholic and Muslim shrine located on Mt. Koressos in the vicinity of Ephesus. The house of Virgin Mary was discovered in the 19th century by following the descriptions in the reported visions of Blessed Anne Catherine Emmerich (1774–1824), a Roman Catholic nun and visionary, which was published as a book by Clemens Brentano after her death. The Catholic Church has never pronounced in favour or against the authenticity of the house, but nevertheless, maintains a steady flow of pilgrimage since its discovery.